Moira Furnace is a restored iron blast furnace built in 1804 by the Earl of Moira. The Earl realized that the area around Moira had great natural resources of iron and coal. He initiated mining activity and built the blast furnace to process the iron ore. The furnace had only a short lifetime, closing in 1811 after only 7 years of operation, though an iron foundry on the same site continued working for another 30 years. After the furnace closed, it was converted into housing for families involved in the Earl's mining ventures. This housing finally closed in the 1970s, and part of the exhibits at the Moira Furnace shows how these mining families lived around the year 1900. The furnace displays include an extensive museum, and exhibits showing how iron was smelted. Visitors can also take a boat trip along the Ashby de la Zouch canal. Return trips lead through Moira Lock to Conkers and back, a journey of about 1.25 hours. There are special events throughout the year and educational opportunities for families and school groups. Recent events include the Moira Furnace Folk Festival, as well as art exhibitions and instructional classes. 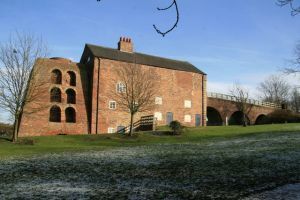 The blast furnace is operated by the Moira Furnace Museum Trust. under the North West Leicestershire District Council. Location: Off a minor road 3 miles west of Ashby de la Zouch. Discounted entry to English Heritage members.